Following on from the success of our superb Power Vibration Plate, Skibbereen Tool Hire are delighted to introduce our latest fitness machine, the “AB Rocket“. Nothing compares to the AB Rocket when it comes to getting amazing results fast. Don’t struggle to lift your neck and back doing crunches! Just sit back, relax and rock! Your neck and back are supported on the contoured back rest while it provides resistance when you lean back. So you don’t just fall back… you get a complete ab workout both forwards AND backwards. It’s a revolutionary way to work your lower, upper, middle abs and even your sides giving you the body you’ve always wanted. It uses “Cylinder Launch Technology” and will tone your abs faster then anything else available today.The technology adds resistance to the entire range of motion forcing you to use all three sections of your abdomen which means you tone and tighten all of your abdominal muscles simultaneously without strain.The AB Rocket comfortably supports your head and neck while the rolling cushion action gives a gentle massage every time you work out. 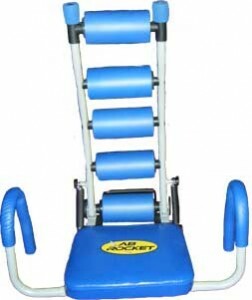 And with 3 levels of resistance, the AB Rocket is perfect for exercise beginners and pros alike.Whether you want to tone your abdominals, strengthen your core or melt inches from your waistline, you will love the results you can achieve with the AB Rocket. BUY NOW FOR ONLY €50!